Gas detector is a device which detects the presence of various gases within an area, usually as part of a safety system. This type of equipment is used to detect a gas leak and interface with a control system so a process can be automatically shut down. A gas detector can also sound an alarm to operators in the area where the leak is occurring, giving them the opportunity to leave the area. This type of device is important because there are many gases that can be harmful to organic life, such as humans or animals. Gas detectors can be used to detect combustible, flammable and toxic gases, and oxygen depletion. This type of device is used widely in industry and can be found in a variety of locations such as on oil rigs, to monitor manufacture processes and emerging technologies such as photovoltaic.They may also be used in firefighting. Gas detectors are usually battery operated. They transmit warnings via a series of audible and visible signals such as alarms and flashing lights, when dangerous levels of gas vapors are detected. As detectors measure a gas concentration, the sensor responds to a calibration gas, which serves as the reference point or scale. As a sensor’s detection exceeds a preset alarm level, the alarm or signal will be activated. As units, gas detectors are produced as portable or stationary devices. Originally, detectors were produced to detect a single gas, but modern units may detect several toxic or combustible gases, or even a combination of both types. 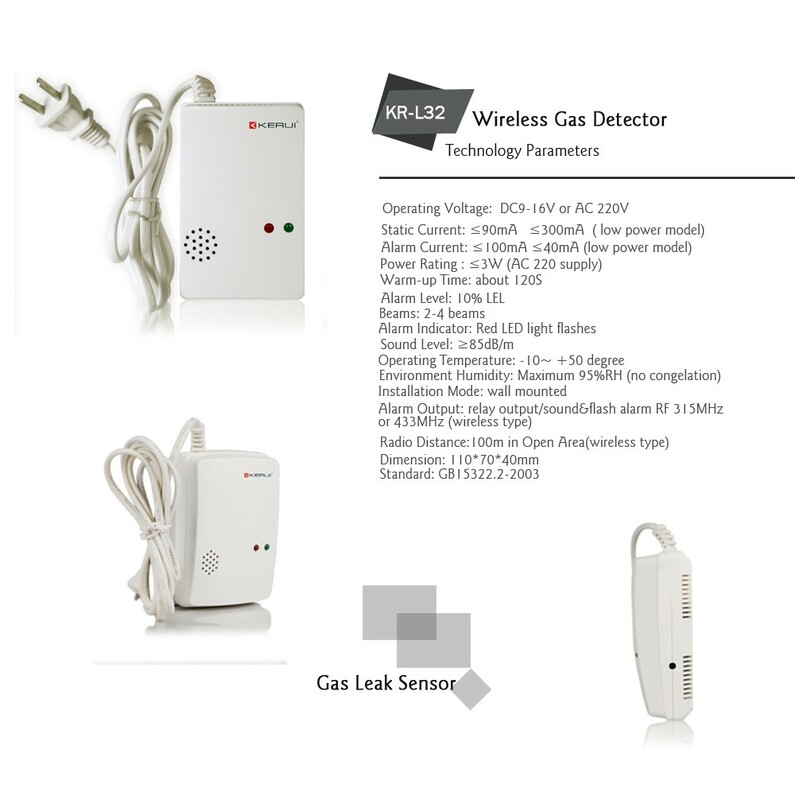 Nowadays gas detector be used in home security system. Combustible gas including gas, natural gas, methane and acetylene, when it is mixed with air, the concentration reaches a certain value, the combustion occurs fire and explosion, it is very dangerous; while household gas leakage occurs, can also cause gas poisoning incident. Combustible gas detector is used in place of the presence of flammable gas, is an important measure to prevent fires.